Tilly and the Buttons: Latest Obsession... Modern Sewciety Podcast! You guys, I'm obsessed. Obsessed with something you should really know about if you're into sewing of any kind - the Modern Sewciety Podcast. Have you listened to it yet? Are you hooked on it too? I first found out about the Modern Sewciety Podcast a few weeks ago when Jen and Kelli were featured and mentioned it on their blogs. I began listening to the episodes while packing orders and cutting fabric, and very soon I was addicted! The show features inspiring people working in sewing - from fabric brands to pattern designers to bloggers and others. It's hosted by a lovely lady called Stephanie who is just SO adorable - not only because of her lovely accent, but what really comes across is her generosity of spirit and the fact that she is so genuinely excited to talk to people who are in the wonderful world of sewing. It's kinda like listening to two friends having a chat, but you also get to hear about the really interesting work that goes on behind the scenes at various companies. This is something that I love to hear because running a (very) small business can be lonely sometimes so it's great to hear how others handle the highs, lows and everything in between. But even if sewing is simply a for-fun activity for you, it's a really nice listen. Hi Stephanie! How would you describe Modern Sewciety to people who haven't listened to it before? Can you sum it up in a tweet? "ModernSewciety, a weekly podcast, with host Stephanie chatting about all things fabric, sewing, inspiration with creatives in the industry. —— that was so hard!!! lol"
"My husband started listening to podcasts long before me and kept suggesting I try to find one about sewing. I searched and found some great ones. I really found I enjoyed the podcasts that were chatty and allowed you to get to know the guests in a relaxed way. I knew I would love to “meet” some of the creatives in the sewing industry and hear their stories about how they got started sewing, what inspires them, and pretend like we were BFFs! 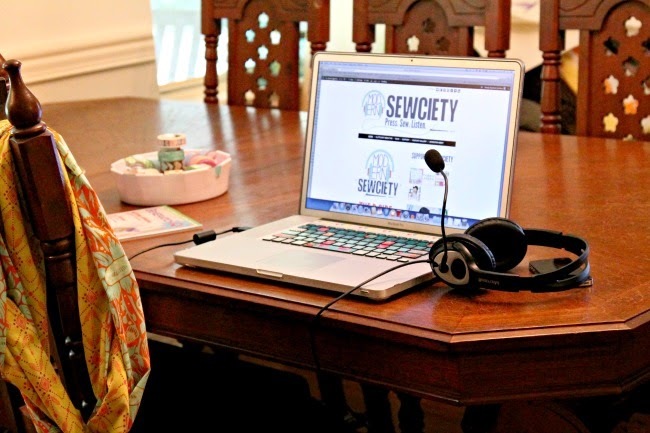 I am not really shy when it comes to talking to others so I thought why not give it a try and so Modern Sewciety was born. I blindly emailed a lot of creatives in the industry that I had followed for a long time to ask them to come on the show and, well, so many said yes. I still can’t believe the awesome people I have had the opportunity to chat with." How did your own love of sewing begin? "My grandmother and mother sewed when I was little. They never really sat down and taught me but I always loved watching them. When I was in college I tried to make a baby blanket for a friend who had just had a little girl. Let’s just say it wasn’t an awesome gift but I really loved trying to make it. Many years later I had my first child and my husband gave me some 'fun' money to spend (he had gotten a bonus) and I bought myself a sewing machine. I didn’t know much but read a lot of blogs and tutorials, and the rest is history. I now can’t live without sewing something all of the time." You've interviewed so many inspiring people for the podcast. Was there one interview or interviewee that stood out in particular for you? Or as you would say, can you choose a favourite child?! "Ha a favorite child… this is hard! I will say that some of the first guests I had on were my favorite. They gave me a chance and came on the podcast when I didn’t know what I was doing. Heck I still don’t! They were all so nice to me and would chat after recording about the podcast, make suggestions, help me with contacts, and that really helped open doors for me. Without them I don’t think the podcast would be what it is today." "Well I have to say I love interviewing everyone. I know. I know it is corny but everyone has a story! I really enjoy having others on to share their story. I think it is inspiring to hear someone chat about who they are, their passions, and most importantly how much they love sewing. I really connect with others by hearing their voice and laugh and I have found that once I start chatting with someone they forget we are recording and then it is just a chat between friends. It is real life and well I love the realness of it." Apart from Modern Sewciety, which is obviously the best sewing podcast in the world, do you have any recommendations for other podcasts that we might like - related to the world of sewing, craft and/or crafty businesses? "I really have a lot of non-sewing podcasts I listen to like This American Life, The Moth, After the Jump (which is Design Sponge’s Grace Bonney), How they Blog the podcast, 99% invisible, Smart Passive Income! lol okay that will get you started! And for sewing-related, I listen to Katie’s Quilting Corner, APQ radio, and I am sure their are more I am forgetting." What would be your top tips for anyone thinking about making a podcast themselves? "I say research. 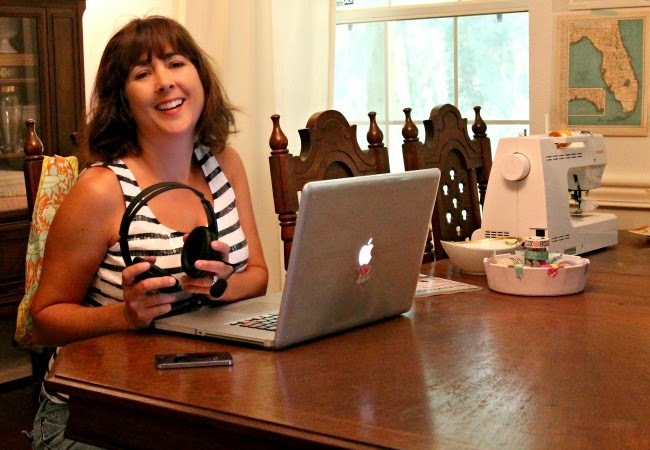 I researched podcasting for a long time before I started mine. 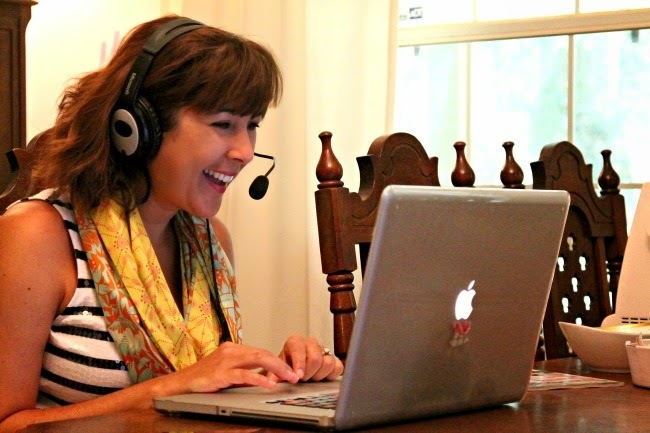 I really think Pat Flynn does an amazing job with his podcasting tutorials. Hey Pat!" Do you have anything exciting up your sleeve for Modern Sewciety that you can tell us about? "I really would like to go to Quilt Market in the Fall and maybe Quiltcon. I am a stay at home mom so I rely on sponsors and listener pledges (find more about that on the support page of Modern Sewicety) to make all of those things possible. I hope to continue to make the podcast more professional and also do more on location shows." Thanks so much for making these podcasts, Stephanie - I love them! Readers, if you fancy dipping into the Modern Sewciety podcasts, take a look at the episodes on offer. And if you like it, you might also like my A Day in the Life interviews too!